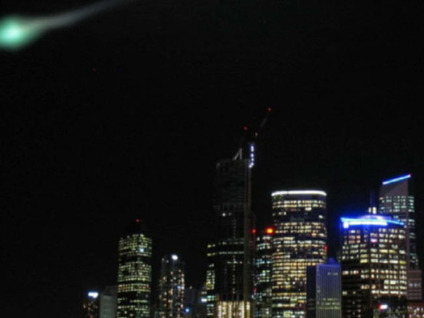 Green fireballs that streaked across the sky and rolled down an Australian mountainside four years ago, spurring reports of UFOs in the area, might have been meteors and ball lightning, a researcher suggests. Green fireballs seen in the Australian sky were captured in photos, this one taken by a member of the public in Brisbane. This photo was first published in the Brisbane-based Courier Mail newspaper, which obtained it from the Channel 9 TV station in Brisbane. Green fireballs have been seen many times in the sky, and are typically explained as meteors whose shockwaves lead to electrically charged oxygen similar to that seen in auroras. In fact, a commercial airline pilot who landed in New Zealand that day reported seeing a meteor breaking up into fragments, which turned green as the bits descended in the direction of Australia. The timing of the fireballs suggests they might have been debris from Comet 73P/Schwassmann–Wachmann 3, said physicist Stephen Hughes at the Queensland University of Technology in Brisbane. The green ball the farmer saw roll down the slope was almost certainly not a meteorite, Hughes said. No perfectly round meteorite a foot wide has ever been found, and if it were one, it wouldn't be rolling slowly down a hill. Instead, Hughes suggests it might have been ball lightning, mysterious glowing orbs of light usually seen during thunderstorms. The green fireball might have provided an electrical connection between the ground and the ionized layer of atmosphere known as the ionosphere, providing the energy needed for ball lightning. Meteors are often mistaken for UFOs, as are lightning, balloons and military experiments. "A transient electrical link between the ionosphere and ground, created by meteors or some other means, could help to solve the mystery of many UFO sightings," Hughes told LiveScience. "Since such balls would be very insubstantial they would be able to move and change direction very fast as has often been observed." Hughes detailed his findings online Nov. 30 in the Proceedings of the Royal Society A.